Graeme Kassautzki of Vancouver, above, defeated Rehman Esmail of Coquitlam, top photo on the left, 6-3, 6-4, to win the Men's Open title. Graeme was runner-up in 2004. The Stanley Park final was a rematch of the Burnaby Open final three weeks ago when Esmail beat Kassautzki. In the Women's Open, Rebecca Marino of Vancouver defeated Kari Wig of Cochrane, Alberta in a close match, 7-6, 6-4. The 14-year-old Marino earlier had to beat Leyla Morzan, left photo, in three sets in the semis. 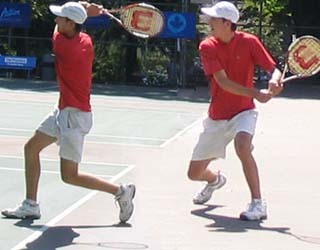 The 6-1 Marino is coached by Vadim Korkh at the People's Court Tennis Club in Coquitlam. In the Mixed Doubles final, Brett Joelson and Ashley Joelson (Oregon) beat Kamil Pajkowski and Leyla Morzan (BC). In the Men's Doubles final, locals Tony Macken and Jaromir Turek defeated Matthew Bain (Texas) and Brett Joelson (Oregon), the winners of last year's event, 6-2, 3-6, 6-1. In Women's Doubles, Sinziana Chis (BC) and Kari Wig (Alberta) beat local favorites Stefi Gjine and Alexandra Odell-Michels, the winners of last week 's ITF final.